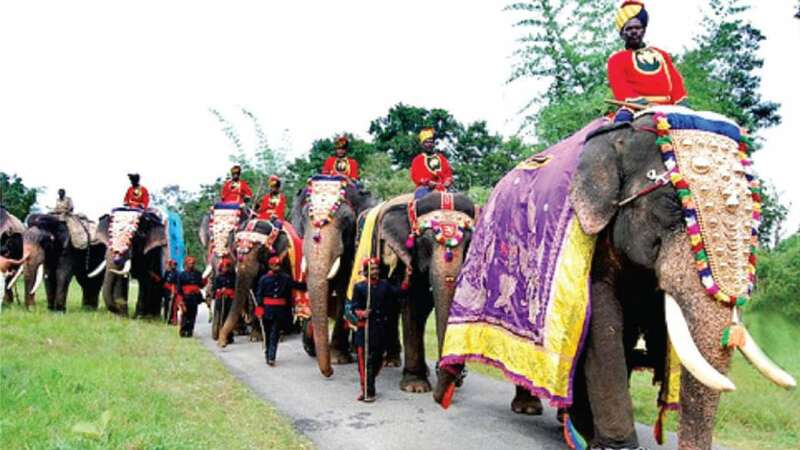 Mysuru: Gajapayana, the traditional march of elephants from the jungle camps to Mysuru Palace to participate in the Dasara celebrations will be held tomorrow at 11 am. The march will begin from the Tribal School at Nagapura tribal hamlet near Veeranahosalli, Nagarahole National Park. District In-charge Minister Dr. H.C. Mahadevappa will flag off the elephant march. Primary and Secondary Education Minister Tanveer Sait, Kannada and Culture Minister Umashree and Tourism Minister Priyank Kharge will be the chief guests. V. Yedukondalu, Deputy Conservator of Forests, Wildlife Division said that for the first time this year, tourists will be brought to Nagapura camp to witness the Gajapayana. A traditional function, complete with cultural programmes will be held at the camp, and over eight to ten cultural troupes including Veeragaase and Dollu Kunitha will take part. The elephants will be taken in a procession for some distance as a formality after the stage programme and will be brought to the Aloka near Yelwal on the outskirts of Mysuru by trucks. A traditional welcome will be accorded to them at the Palace on August 17. The district administration has decided to insure all the Dasara elephants, mahouts and kavadis. This year, as three additional elephants will arrive to participate in Dasara celebrations, 15 elephants, and their mahouts and kavadis will be insured for Rs. 1 crore. Thousands of people, including foreign tourists, visit the city to watch the Dasara procession and there is a risk factor for elephants, mahouts and kavadis during the 5 km procession. A city-based general insurance company has been roped in to provide the insurance cover. The short-term insurance policy, which will cover them for a month, will come into effect from the time the elephants are transported from the forest to Mysuru. It becomes void when the elephants return to the woods safely. The District Minister will announce the name of the guest who will inaugurate this year’s 10-day Dasara festivities atop the Chamundi Hill on Sept.21. The announcement will be made tomorrow after he flags off Gajapayana.